Sometime in the early-to-mid 80s, a bunch of would-be adventurers helped resurrect the tiki-bar craze. Still thriving today, tiki bars confuse reality and fantasy, providing purveyors with colorfully ridiculous representations of a relaxed island life all while peddling debauchery in the form of high-proof rum-drenched drinks. Little truth can be found inside tiki bars, as their representations of Polynesian life are based upon outsiders’ nostalgia for a past that never existed. No matter. For many, the entirely modern creation offers a cheery albeit sinful escape into a make-believe vintage world. 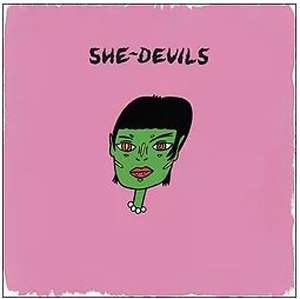 Montreal’s She-Devils chase a like-minded sort of getaway on their debut. Surf-rock guitars and baroque-pop variations suggest a beachfront lifestyle. Plenty of depravity exists as well, arriving in the form of the words that often probe varying degrees of lust. Throughout, vocalist Ann Boucher musical partner Kyle Jukka construct songs out of seemingly found parts. Arrangements feel cobbled together from guitar bits and abstract concepts left behind at a swanky lounge once frequented by Andy Warhol. Think of the project as Quentin Tarantino with a synthesizer. She-Devils’ pastiches are of the moment, but made to sound as if from another era. While parts of the album certainly come off as postcards from the 60s, the She-Devils aren’t dedicated to the art of resurrection. A toy-like playfulness pervades the arrangements and makes the duo sound more like kids rummaging through mom and dad’s attic, picking up and discarding styles as if they’re only to be worn for as long as it takes to create an Instagram post. The go-go dancing strut, sultry come-ons, and outer-space buzz of “Hey Boy”? Snap. The Nancy Sinatra swagger, pinpoint guitars, and bachelor-pad psychedelics on “Darling”? Snap. The alien static, flowery balladry, and woozy yearning of “How Do You Feel”? Snap. All this is to say that when it comes to surface style, She-Devils got it. Boucher functions an oddly appealing vocalist. However untrained, she sings with a detached, Nico-like coolness (snap!). She carries the hula-meets-Western strum of “Never Let Me Go” (snap!) and steers the take-it-slow tale of “Blooming,” in which a thick, Beach Boys-like bass line delivers what could be the rejection letter in response to “Wouldn’t It Be Nice” (snap!). Throughout, ambient noises flutter in and out, as if to remind us that She-Devils exist in 2017 and not 1967. But they are like filters that we apply on a photo to make it more palatable for social media, here and there giving the She-Devils a brief, tech-savvy makeover. We’re left with a collection of scenes—a visit to the past that’s one more chic than studious. The songs are a trip down memory lane, but an imagined one—a cultural mash-up that doubles as a tiki-bar recreation of a history no one ever really lived. Or, to use a more modern metaphor, consider She-Devils the musical equivalent of a clever photo op for our app-driven age. The She-Devils know how to get our attention, but still have to work on holding it.